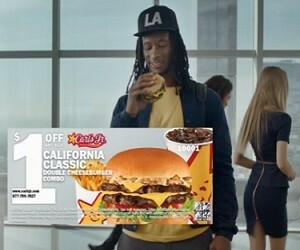 Carl’s Jr brings in the Los Angeles Rams Running Back Todd Gurley in its latest commercial for the new California Classic Double Cheeseburger, launched to celebrate its 75-year history as one of California’s most iconic brands. The 44-second ad stars the American football player having a discussion with his agent, played by an actor-comedian turned sports radio personality, who welcomes him to California. “As your agent, I want to welcome you to California”, says the agent. “Todd, you’re hungry?”, asks him. A simple nod of Tod’s makes the agent scream on the hallway that Todd is hungry. “I like burgers”, answers Gurley. “Of course you do. This is a Carl’s Jr California Classic – double meet and cheese, grilled onions, Thousand Island. “Thanks for the burger”, replies Gurly before having a bite. After a short joke about the percentage he gets, the agent shouts, in the middle of an office, “Welcome to California, Todd Gurley!”. Seeing the look on Gurley’s face, the agent adds “They’re not allowed to shout with me”. The California Classic Double Cheeseburger is available starting at $2.49, only at Carl’s Jr.